Classic model lovers have now their own collection: Etnia Vintage. In fact, they are made with shapes and materials classic from the 70s. DNA from Etnia Barcelona glasses is always present, with colour in the temples. 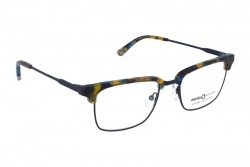 This collection offers models both in acetate and metal. Also, some acetate models have details in metal, giving the glasses a 70s touch. From this collection we can emphasize mdoels as Kitsilano, Mission Disctric, Jordaan, among others. This collection brings us glasses for all tastes that will not go unnoticed.